The chronometry planetary regoliths, with an aim to contribute to solving important scientific questions such as: When did planetary differentiation occur in the asteroid belt? When were the major impact events in the inner Solar System, and did all bodies experience the same history? 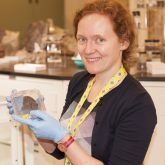 Can we characterise and identify regolithic meteoritic materials? Can secondary processes like weathering be quantitatively constrained? Understanding the structures and compositions of undifferentiated meteorites (chondrites) at micro- and nanometer-scales, to help determine when the first solids in the Solar System formed, and to determine what processes led to their formation. Keywords: Planetary Science, Cosmochemistry, Noble Gases, Halogens, Meteorites, Mars, Chondrites, The Asteroid Belt, Chronology. I am looking for motivated graduate and undergraduate students with an interest in planetary science and cosmochemistry to pursue topics in noble gases and chronology, as well as compositional studies of meteorites. Do contact me if you’re interested in pursuing an undergraduate research project, a masters degree or PhD in my group! The CCL Group at the University of Alabama Department of Geological Sciences announces the availability of a fully-funded MS or PhD position in the area of chronology studies of achondrite meteorites. The project involves the analysis of selected clasts within meteorites using multiple chronometers to improve the understanding of the impact flux in the inner Solar System. Rampe, E.B., Cartwright, J.A., McCubbin, F.M., Osterloo, M.M. The Role of Halogens During Fluid and Magmatic Processes on Mars. (2018). The Role of Halogens in Terrestrial and Extraterrestrial Geochemical Processes (Book). Springer. Cartwright J.A. Noble Gas Chemistry of Planetary Materials. (2015). Planetary Mineralogy (Book); EMU Notes in Mineraology, 15:165-212. Cartwright J.A., Ott U. and Mittlefehldt D.W. (2014) The quest for regolithic howardites. Part 2: Surface origins highlighted by noble gases. Geochimica et Cosmochimica Acta 140:488-508. Cartwright J.A., Ott, U., Hermann, Agee, C.B. (2014) Modern atmospheric signatures in 4.4 Ga Martian meteorite NWA 7034. Earth and Planetary Science Letters 400:77-87. Mittlefehldt D.W., Herrin J.S., Quinn J.E., Mertzman S.A., Cartwright J.A., Mertzman K.R., and Peng, Z.X. (2013) Composition and petrology of HED polymict breccias: The regolith of (4) Vesta. Meteoritics & Planetary Science 48:2105-2134. Farley, K.A., Hurowitz, J.A., Asimow, P.D., Jacobson, N.S., and Cartwright, J.A. (2013). A double-spike method for K–Ar measurement: A technique for high precision in situ dating on Mars and other planetary surfaces: Geochimica et Cosmochimica Acta 110:1-12. Cartwright, J.A., Ott, U., Mittlefehldt, D.W., Herrin, J.S., Hermann, S., Mertzman, S.A., Mertzman, K.R., Peng, Z.X., and Quinn, J.E. (2013) The quest for regolithic howardites. Part 1: Two trends uncovered using noble gases: Geochimica et Cosmochimica Acta 105:395-421. Cartwright, J.A., Gilmour, J.D., and Burgess, R. (2013) Martian fluid and Martian weathering signatures identified in Nakhla, NWA 998 and MIL 03346 by halogen and noble gas analysis: Geochimica et Cosmochimica Acta 105:255-293. Llorca, J., Roszjar, J., Cartwright, J.A., Bischoff, A., Ott, U., Pack, A., Merchel, S., Rugel, G., Fimiani, L., Ludwig, P., Casado, J.V., and Allepuz, D. (2013) The Ksar Ghilane 002 shergottite—The 100th registered Martian meteorite fragment: Meteoritics & Planetary Science 48:493-513. Cartwright J.A., Ocker K. D., Crowther S.A., Burgess R., and Gilmour J.D. (2010) Terrestrial and Martian weathering signatures of xenon components in shergottite mineral separates. Meteoritics & Planetary Science 45:1359-1379. Cartwright, J. A. *, Perez-Huerta, A., Leitner, J., Vollmer C. (2018). Micro- and Nano-Scale Petrological and Compositional Analysis of Chondrule and CAI Rims. Goldschmidt 2018, Boston, Massachusetts, USA. Cartwright, J. A. *, Perez-Huerta, A., Leitner, J., Vollmer C. (2017). Exploring Chondrule and CAI Rims Using Micro- and Nano-Scale Petrological and Compositional Analysis. AGU Fall Meeting, New Orleans. Hodges, K.V., van Soest, M.C., Mercer, C.M., Cartwright, J.A., Horne, A.G., Brunner, A.E., McDonald, C.S. and Schoene, B. (2016) The Persistent Challenge of Accurately and Precisely Dating Impact Events. 128th Geological Society of America Meeting: (#144-6). Cartwright, J.A. *, Amelin Y., Koefoed P. and Wadhwa M. (2016) U-Pb age of the Ungrouped Achondrite NWA 8486. 79th Meteoricial Society Meeting (#6231). *Oral presentation. Cartwright, J.A. *, Hodges K.V., Wadhwa M. and Mittlefehldt D.W. (2016) Dating Howardite Melt Clasts: Evidence for an Extended Vestan Bombardment? 47th Lunar and Planetary Science Conference: (#2865). *Poster presentation.